This is one of the views from my knitting chair. It looks quite festive and "winterish" doesn't it? My kitchen isn't a big one, but it's the biggest one I've had in the four homes we've lived in since we were married. And I like that my island is on wheels so I can move it around for potluck dinners and parties. 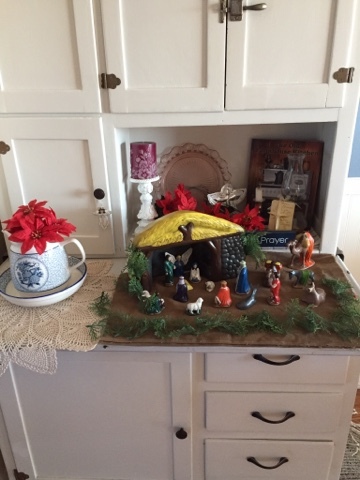 To the left of the photo above is my Hoosier cabinet with the nativity I made for our very first Christmas we were married. A closer look. I even painted faces on each figure although you can't see it here. In all of these 38 years, this nativity has had pride of place and not one figure has ever been broken. Little Sophie went home Saturday night and I really do miss her on my lap. She's coming over to spend the day tomorrow because there are workmen coming to put a new tub/shower in Larry and Nita's house and Sophie will bark at them. She doesn't like people she doesn't know invading her home. She never barks at Dennis or I, just happy yips when she sees us. :-) She really is cute isn't she? All 4 pounds of her! 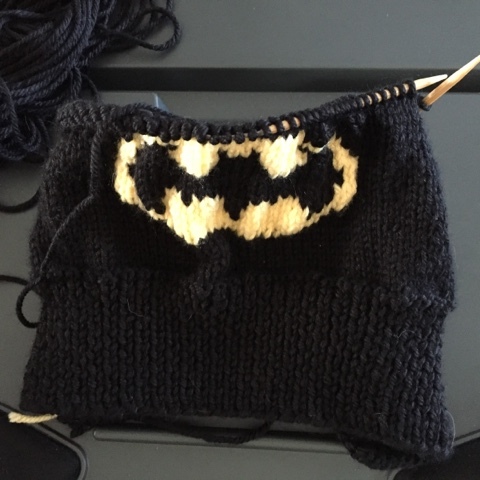 I'm busy making the second batman hat and have one more to make. This one seems to be turning out a bit better. The fit on the twins was just right, so I'll need to make the third one a bit smaller. I'm still trying to figure out if I should go down a needle size or just cut back on the number of stitches. Any advice out there? Here's little Trevor trying the first one on. It's big for him so should fit the twins perfectly. Although they are over a year younger than he is, they have HUGE heads. Seriously. Their heads are bigger than some adults. I think they are going to be big boys when grown. You can see how happy he is with the hat though. It started snowing Thursday. And it snowed Friday. And Saturday. And Sunday. 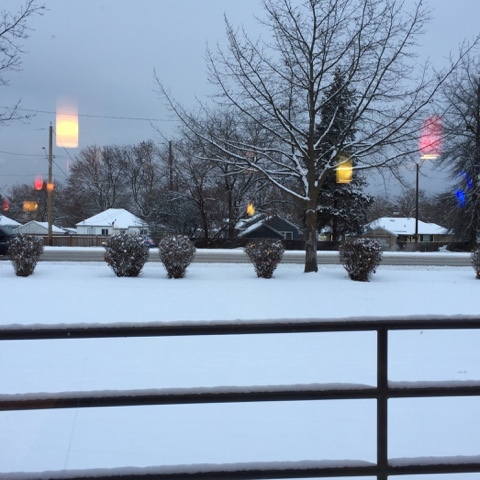 We went to dinner at Applebee's Saturday night and I took this photo from the window. I like how the lights inside reflect outside. Although the snow is pretty, I'm done with it now. Unfortunately the weather doesn't agree with my wanting it to stop. This was outside our window Sunday evening. Yesterday I opened the mailbox to this sweet package from Araignee. (Her blog is on my sidebar.) She very generously sent me all of these goodies. I honestly don't know how she does everything she gets done in a day. Wasn't this just so sweet of her? 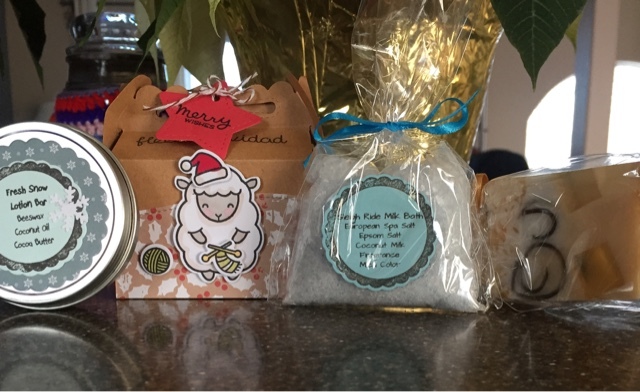 Her lotion bars are amazing. The one she sent me a few months ago is almost gone because I use it constantly. My favorite is the knitting sheep on the box. I love, love, love her. I'm going to have to find a way to keep that box out to look at because it just makes me smile. 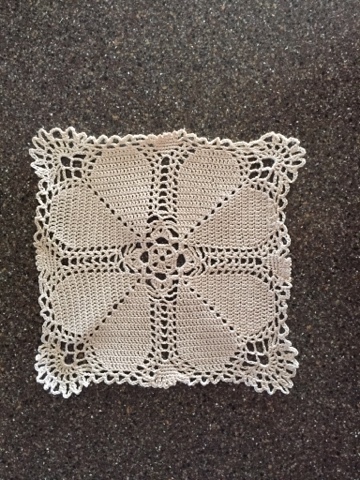 Another doily finished. I do want to make more, but I have to finish the batman hats and then I have three more blankets to join together for the Crisis nursery. Busy, busy, busy. And look what Dennis got for me on Sunday. A Christmas camper! Is that perfect for me or what? It even has a little dog that looks like Chloe and a man and woman that look a bit like Dennis' and me. I just love this and it sit's right where I can see it all of the time when I'm in my knitting chair. We don't have a tree this year, so I've decided this makes a great substitute. And it has a snowman! I adore snowmen and collect them. I leave them out all winter, not just at Christmas and I find them very cheerful. Oh, Dennis also bought himself a chainsaw. :-) I prefer my little trailer as a gift, rather than a chainsaw. Ha! I hope you're all having a wonderful December. It's a busy month for a lot of people. Our life is pretty much the same since no one will be here for the holiday. I'm trying to keep my focus on the reason we celebrate Christmas and remember just how much I have to be grateful for. Jesus is at the very top of that list. Snow!!!! I need a few flakes-a few. I love that little camper decoration. It really is adorable. I'm glad you liked my little sheep. They were so much fun to make. You have been busy! I like the batman hats! 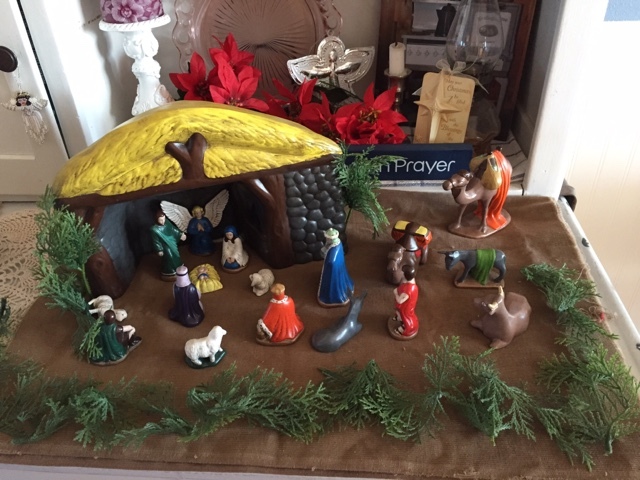 My niece made me the same Nativity in 1976 - all in a mother-of-pearl glaze. The donkey's ear has been broken, but all the other pieces are intact. Walking in the mall is a good alternative for bad weather walking. LOVED your post today Betsy! The little trailer is adorable and your Nativity set is awesome! I can see why you are so fond of the little knitting sheep-too cute! Glad you are up and about now, but hoping you don't overdo it too soon. I'll gladly watch Sophie if she ever gets to Ohio. 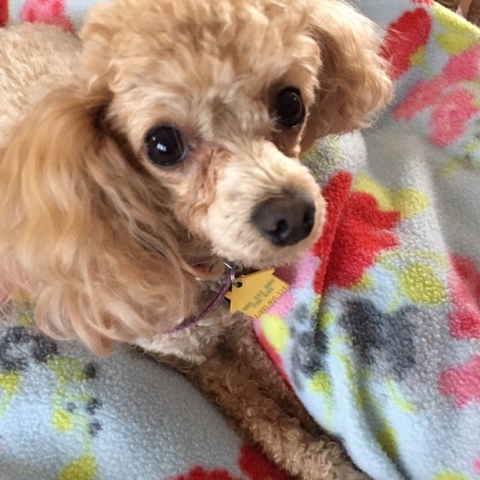 She reminds me of my Lil Miss Buffy who is a 3 1/2 pound buff colored poodle. 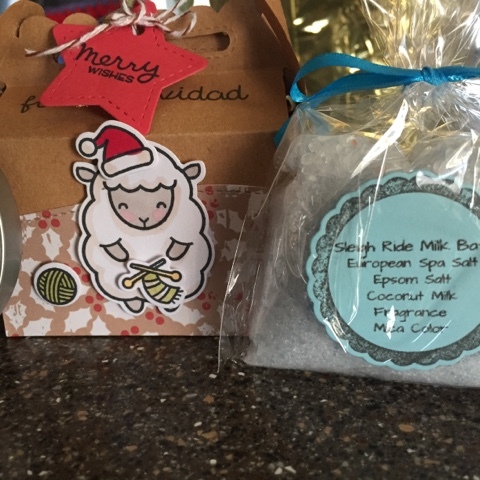 All those goodies looked a real delight, I love the sheep tag too. The camper was adorable you are blessed with such a thoughtful husband. I am thrilled to hear you are managing to walk about the mall but don't overdue things. You are certainly keeping busy with all your craft projects, my grandsons would love those hats. I fell in love with the doily. Take care. I can't get over those Batman hats! They are just wonderful! And, your view is very festive and homey. The nativity set you made is just gorgeous. 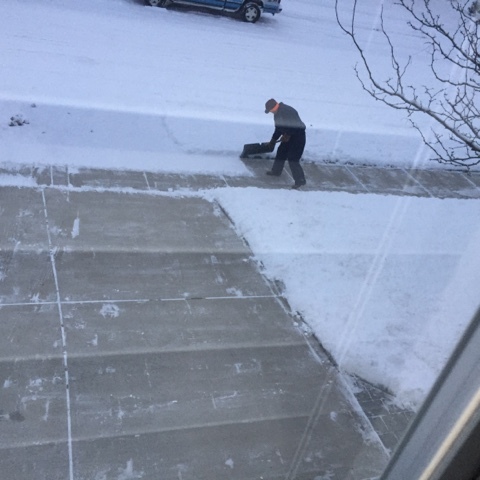 So thankful you felt well enough to go out and shovel, but hoping you don't overdo yourself. I am sure it did earn you a talking to...just because he cares so much! God bless you to be able to continue to enjoy this beautiful Christmas season, my friend! You sound better Betsay, for that I am thankful. 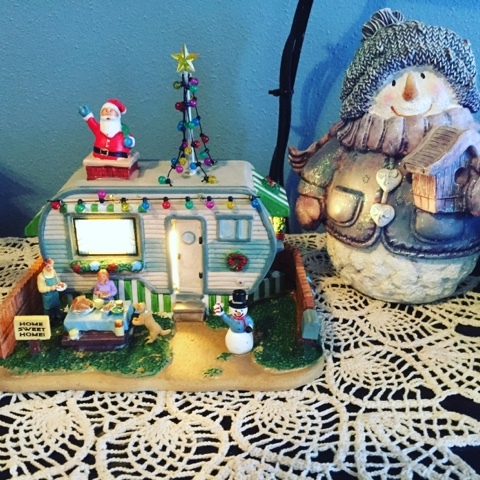 Love the nativity you made and Dennis found you the perfect gift with that adorable camper. Good for you walking in the mall. I am not a mall fan but with the snow and ice you are safer there. Love your camper and the batman hat - very nice! Stay warm!!! That doily is wonderful! Looks like you are all ready for the holidays; not so much here. We had a big choir concert this past Sunday that was consuming our time and energy. Now there are gifts to wrap and mail, and a few still to create. Hope we get some of that sunshine here. So glad to hear you are getting out to walk. I bet that will make you feel better too! The snow is so pretty. And that nativity is so special! I saw your vintage camper on IG, and oh how I love it. 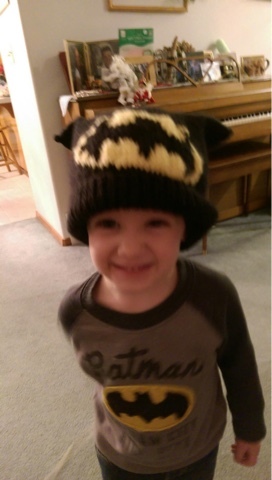 The batman hat is so cute! And the antler toque too! Your house looks so cheery with your nativity and snowmen. Your camper from Dennis is cute. We have 2 inches of snow so far. 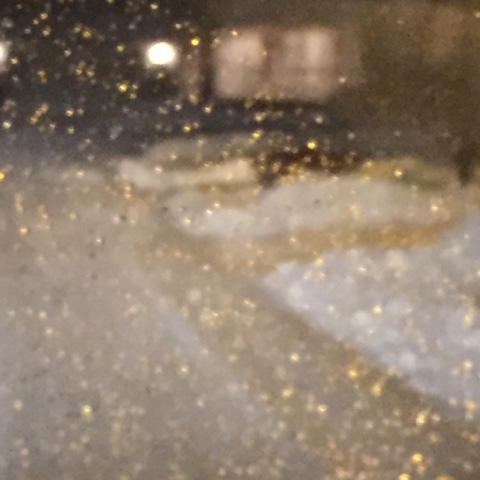 I posted photos on Facebook this evening of the snow. I need to finish my Christmas cards this evening. Head for bed soon since there's a chance I will need to go to work tomorrow. Will see how much snow we get overnight. I'm glad you're walking indoors. Our mall is semi enclosed and a good place to walk. I'm sure this time of year it's busier though. Stay strong and well. I love the little camper- how cute! I walk in my house, and it takes getting used to because I am a clumbsy person. But I cannot be trusted outdoors- I have fallen over my own two feet too many times! Enjoy your weekend! Hi Betsy, I hope you're all faring well in the snow up there. I saw the storm in the news and thought of my northwestern blogging ladies. I'm glad you're able to walk at the mall, that's a nice idea for these cold months. 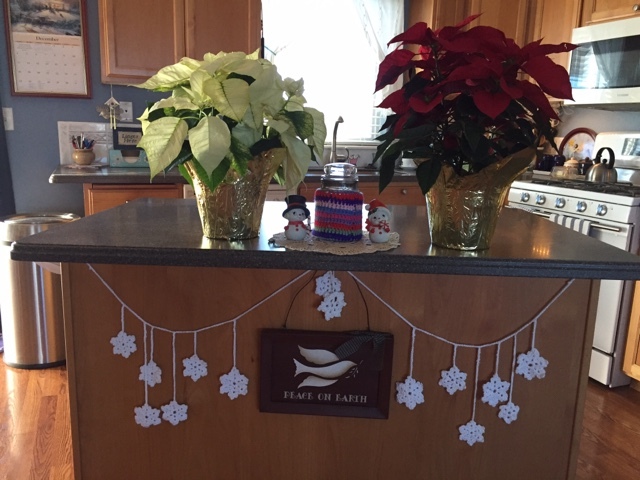 I enjoyed seeing your kitchen and your decorations and projects. I have a small kitchen too but mine is also the nicest I've had since I've been married, so I'm very proud of it. It's plenty for my needs, which are not great. I'm only cooking for four, after all! I hope you have a good weekend, take care and enjoy. I see you comments on Araignees blog and I thought I would like to check out yours! I like what you have to say and you make doilies!!! No one does that any more; I enjoy having the old ones I own and making new! And Jesus is at the top of our list, too! Nice post! Ah wonderful post Betsy, hope this publishes okay as it wouldn't work for quite a few goes..
Love your Hoosier cabinet Betsy and your nativity scene it's simply beautiful wonderful to remember the greatest gift of all. Pray the snow stops so you don't have to heave snow to clear a path, love that you going walking in shopping centres to get your walking done, I do that when it's too hot here. Blessings upon you as we remember Jesus' birthday and a healthy 2017, one in which God willing you can fly to see family. Cold! and Snow... rinse and repeat!